We've got quotes and memes to go along with your crutch or vice. Chocolate soothes the soul, and now they say it has health benefits too! Count me in. What does chocolate mean to you? Do you crave chocolate or use it as a pick me up? Chantbou chocolate is waiting for you. Here's annother chocolate quote meme. Enjoy! 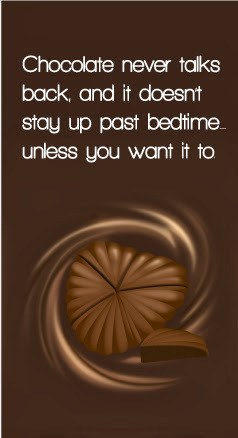 Here is a chocolate quote meme for your Pinterest Board or Facebook Posts.